Standing atop the Nuuanu Pali lookout, a canopy of stars that can only be found in places like the middle of the Pacific Ocean unfolds across the darkness overhead. Salt-tinged trade winds swirling upward from Kanehoe Bay seem to carry the haunting cries of the warriors who plunged to their deaths from these 1,200-foot-tall cliffs in the Koolau Range more than 200 years ago. 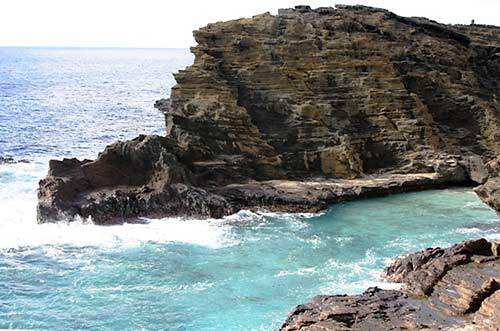 Getting to Halona Cove, which is tucked into an inlet alongside Halona Point, requires a rather perilous descent—but its seclusion was perfect for Burt Lancaster and Deborah Kerr to create one of the most infamous love scenes in Hollywood history. Their wet sand frolic with surf lapping at their feet in what was, for 1953, a most risqué scene, helped propel “From Here to Eternity” to 22 awards including eight Oscars. 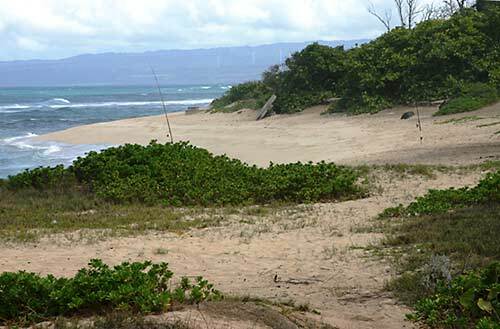 The grass-dotted sands and snorkeling opportunities at Mokuleia Beach Park are relatively undiscovered, perfect for a quiet afternoon to contemplate how good life can be in the Islands. On Sundays the nearby Hawaii Polo Club holds dignified competitions, a huge contrast to that “Date Which Will Live In Infamy” when 40 torpedo planes and 49 high-level bombers in Japan’s first wave attack on Pearl Harbor flew directly over this very spot. Each of the four “main” Hawaiian Islands has its own unique icon, an image which comes to mind when that island’s name is mentioned: Kauai’s dramatic Waimea Canyon, Maui’s massive Haleakala, Hawaii Island’s observatory-sprinkled/snow-dusted Mauna Kea. Oahu’s icon, although a physical location, comes to mind as an event: Pearl Harbor. These islands can truly be an idyllic paradise, but have also—particularly Oahu––been a turbulent battleground of wills and ways. 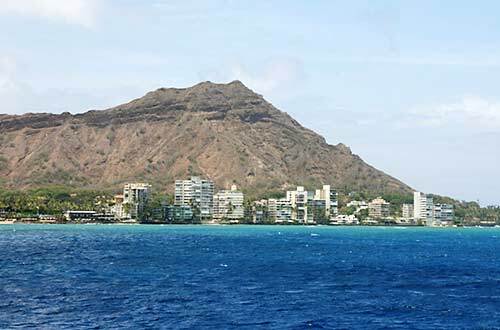 Oahu’s origin began over 3.5 million years ago when Waianae (above left) exploded above the surface of the sea, joined by its sister Koolau (above right) about a million years later to form the backbone of the third largest island in the Hawaiian chain. 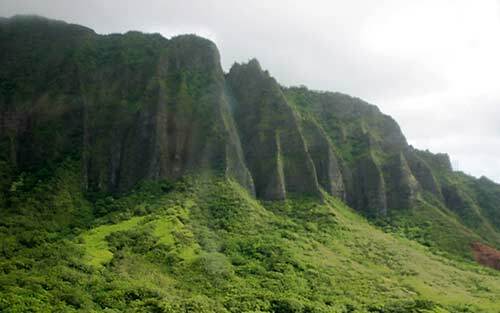 The island was significantly larger until a massive landslide plunked half of Koolau’s volcano into the sea, forming Kaneohe Bay, and a half-million years of erosion has reduced the remainder to one-third its original height. Winter at Waimea Bay typically brings 20-30-foot swells with peaks up to 40 feet—some of the biggest rideable surf in the world. But summer provides calm water perfect for snorkeling. Palms fringe the shoreline at Papaoneone Beach in Makaha, an area known for huge winter waves and a favorite of locals who come to fish, grill their catch, strum ukuleles and “talk story.” Makaha has been the venue for Buffalo’s Big Board Surfing Classic since 1976, and a popular diving cave, Ulua, lies offshore. 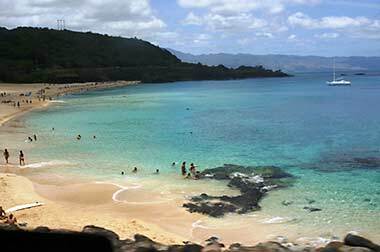 Known as “The Gathering Place,” a nickname as accurate in pre-contact times as today, Oahu measures 44 miles long by 30 miles at its widest, with more than 125 beaches spread around a 112-mile shoreline. This speck of land in the middle of the Pacific, over 2,500 miles from Los Angeles and closer to Japan than to the East Coast of the U.S., has “gathered” an impressive inventory of people and events over its relatively short inhabited history. The carefully restored Hale o Lono Heiau, originally constructed between 1470 and 1700, sits near the entrance to Waimea Valley, a sacred vale once inhabited by farmers and fishermen and filled with important archaeological sites. 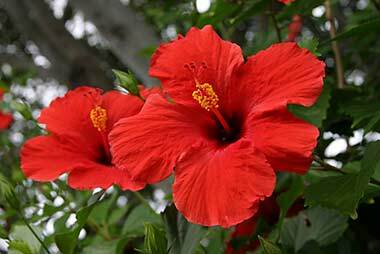 Dedicated to Lono, god of peace and agriculture and fertility, ancient Hawaiians honored him with “Makahiki” season, a celebration of their new year, which is still observed here. 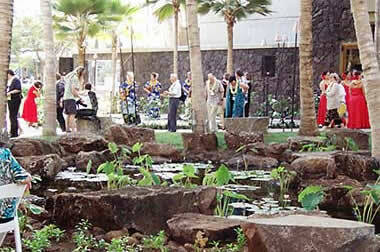 The first Polynesians arrived and began settling the major islands in the Hawaiian archipelago around 1500 years ago. Different chiefs ruled sections of each island until the rise of King Kamehameha I, aka Kamehameha the Great. 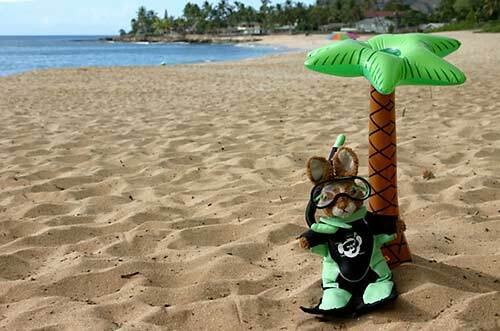 After conquering his home island of Hawaii and neighboring Maui, Lanai and Molokai, he set his sights on Oahu. 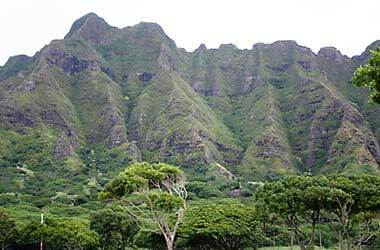 In 1795, during one of the bloodiest battles in the history of old Hawaii, Kamehameha’s forces drove the Oahu defenders up into the Koolau Mountains and off the edge of the cliff. Fifty years after the Battle of Nuuanu Pali, Kamehameha III moved Hawaii’s capital to Honolulu. The Kingdom of Hawaii suffered through the arrival of bible-toting, culture-repressing missionaries and morally-challenged, disease-bearing whalers. But its final downfall came from American businessmen, many of them descendants of the missionaries who came to “save” the native populace. 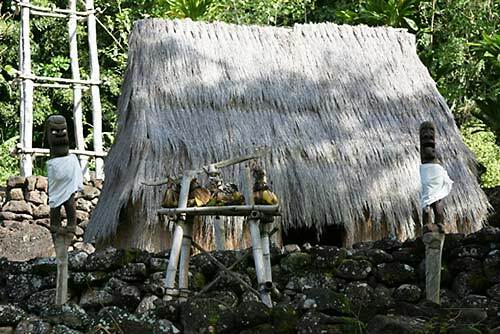 Hawaiians believed they were caretakers of the land. The concept of land ownership was as foreign as the people who now demanded title to ancestral and sacred grounds. Aliiolani Hale (House of Heavenly Kings) was designed as a royal residence for King Kamehameha V, but realizing Hawaii desperately needed an administrative center he commissioned it to be constructed as an office building. 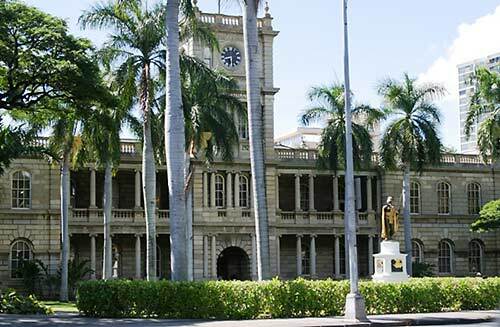 Completed in 1871, it was the seat of government for both the Kingdom and the Republic of Hawaii, and now houses the Hawaii State Supreme Court. The 18-foot bronze statue of King Kamehameha was erected in 1883. The building also serves as the stand-in for the TV series “Hawaii Five-0” headquarters. By 1893 the conflict between supporters of the monarchy and the land-hungry Americans boiled over. Without approval from the U.S. Government, the come-latelies utilized U.S. Marines to overthrow Queen Liliuokalani, establish a provisional government to create the Republic of Hawaii, and eventually imprison the Queen in her own palace. Despite formal protests by the Hawaiians and supporters of their indisputable rights, in 1898 President McKinley formally annexed the islands as a U.S. territory until its statehood in 1959, another intrusion not welcomed by much of the native population. While all this political turmoil was going on, the ethnic make-up of the Islands was undergoing a drastic change. 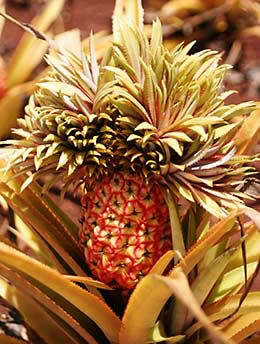 A massive amount of labor was needed for the booming sugar and pineapple plantations, and in 1852 workers arrived from China. Hawaii’s population was 97% indigenous in the mid-19th century, but more workers appeared from Japan, Korea, the Philippines, Portugal and Puerto Rico. By 1880 Honolulu had its own Chinatown. More and more mainland Americans were moving to the islands. By the first quarter of the 20th century, the indigenous population had plummeted to just 16%. Today’s Hawaii is ten times more multiracial than the average U.S. population, and still radiates a more Polynesian and Asian ambiance than American. The pink stucco exterior of the Moorish-styled Royal Hawaiian gave rise to its nickname “The Pink Palace.” The Royal Grove pays homage to the area’s royal past with stands of coconut palms, native flora, areas for hula and other entertainment, and has become a gathering spot linking the grounds of the Hotel with the retail and dining options at the Royal Hawaiian Center – all situated on the Queen’s former estate. The same year the Hawaiian monarchy was overthrown, the Sans Souci Hotel opened its doors along the shoreline where Kamehameha the Great challenged the surf atop 15-foot koa wood boards, becoming Waikiki’s first property to reach legendary, world-wide status. But the very first to welcome visitors - the Hotel of Waititi (a common mispronunciation of “Waikiki” at the time) - had opened more than a half-century earlier. By 1927 the Royal Hawaiian was welcoming visitors on the grounds of Queen Kaahumanu’s former summer palace where a 10,000-tree coconut grove once thrived. 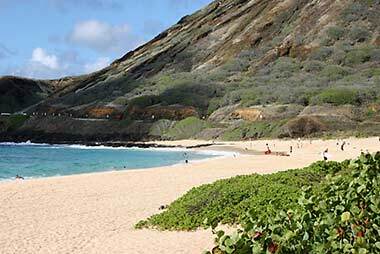 Synonymous with sun, sand and surf, Oahu’s beaches are at the top of most visitors’ Wanna-Do list. And why not, since the water-play options are nearly endless with all the anticipated fun stuff plus whale watching and swimming with sharks, flyboarding and parasailing, deep-sea fishing or watching the fishies from an underwater viewing port aboard an Atlantis Adventures submarine. 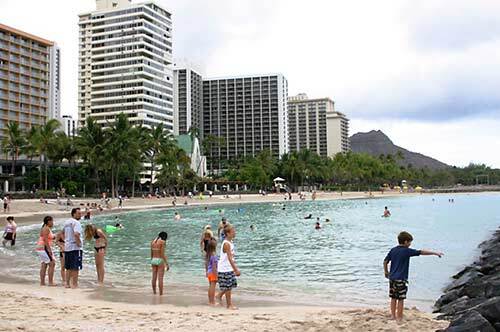 One of the most iconic and easily identifiable beaches in the world, Waikiki was a favorite playground and summer residence site for ancient Hawaiian royals, its streams teaming with shrimp and fish. Actually a two-mile-long ribbon of distinct and unique sections, today her long curve of white sandy shoreline and predictable surf breaks still draw the bulk of visitors to Oahu. Waikiki’s shoreline begins with Kahanamoku Beach, named for Hawaii’s famous Olympic swimmer and the Father of Modern Surfing, Duke. 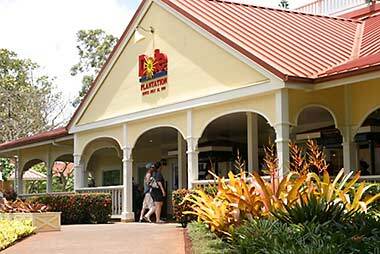 Located adjacent to the Hawaiian Hilton Village Resort, families enjoy the protected sandy-bottomed swimming area and free fireworks shows on Friday evenings. A short jaunt along the Fort DeRussy Boardwalk brings visitors to that namesake Beach Park, a grassy setting with picturesque palms and the U.S. Army Museum of Hawaii. I’m not a military enthusiast but the Museum is fascinating with displays and equipment detailing the martial history of Hawaii from ancient times to the Vietnam War. 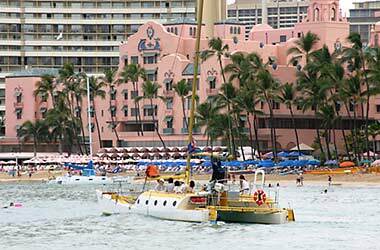 Fronting the Royal Hawaiian Hotel and Moana Surfrider, Kahaloa and Ulukou Beaches are activity central with an array of water toys. 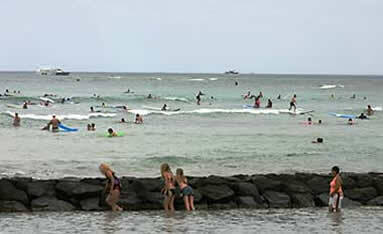 Breakwaters at Kuhio Beach create a tranquil, sandy-bottomed area perfect for the keiki (children). One of Waikiki’s most popular sections, Kuhio is also home to a free conch-shell-blowing-torch-lighting-hula ceremony at the Kuhio Beach Hula Mound every day at sunset. 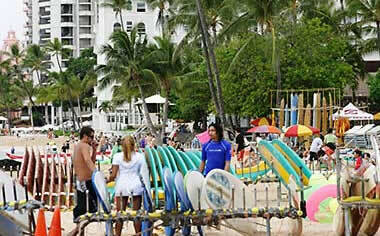 Beyond Kuhio is Queen’s Surf, a nice section for sunbathing and snorkeling. It’s also home to “Sunset on the Beach” where free movies are shown on a 30-foot outdoor screen accompanied by pre-show entertainment and food vendors. 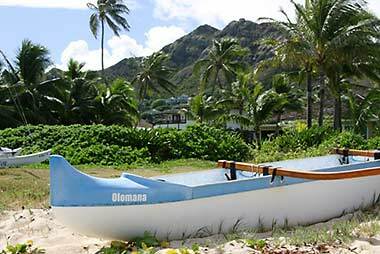 A bit further along the Waikiki strip is San Souci Beach with respectable offshore snorkeling and a natural channel through the reef allowing ocean access for outrigger canoes, kayakers and surfers. 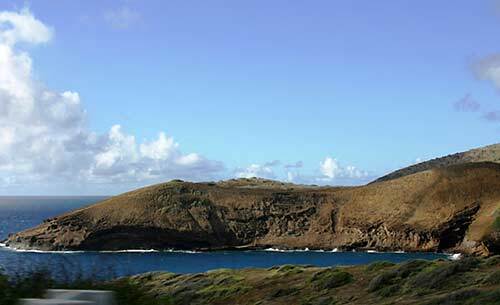 to Hanauma Bay, a nature preserve plopped inside the crater of an extinct volcano. but draws about 3,000 visitors a day so you need to get there early. Named for its view of spectacular evening displays, Sunset Beach offers safe water play in the summer and challenging surf in the winter. The ubiquitous shrimp trucks along the North Shore owe their start to Giovanni’s, who began selling the locally raised crustaceans out of a converted bread truck in 1953. 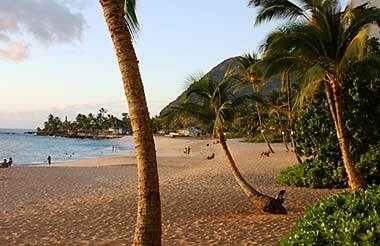 Oahu’s second-most famous shoreline is undoubtedly the North Shore, a string of world-class surf spots whose names are legendary: Sunset Beach, Banzai Pipeline, Waimea Bay. These celebrated breaks reap the benefit of massive storm swells building in the north and slamming into an offshore coral reef creating curls and tubes that make experienced riders salivate. 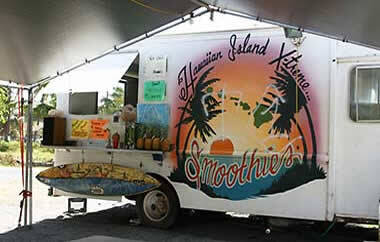 Shrimp and other food trucks lining much of the road from Kahuku to Haleiwa cause almost everyone to drool. 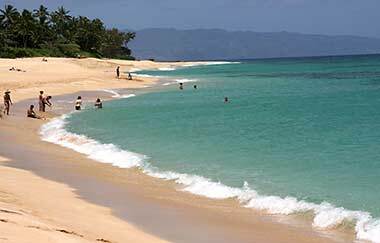 Hub of the North Shore and a designated State Historic, Cultural and Scenic District, Haleiwa still radiates the charisma that drew surfers and hippies in the 1960s. a two-mile stretch of pounding surf. with few visitors. Another section of Pupukea, Shark’s Cove, is popular with cave divers. 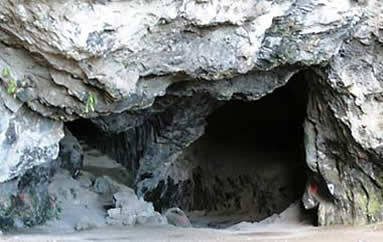 Fortunately the name derives from the shape of the cave, not its residents. On the Windward side, breathtaking sunrises greet Lanikai Beach and the Mokulua Islets, a backdrop featured in countless professional photo and calendar shoots. Originally the eastern edge of the Koolau caldera, “The Mokes” are a seabird sanctuary and popular kayak destination. 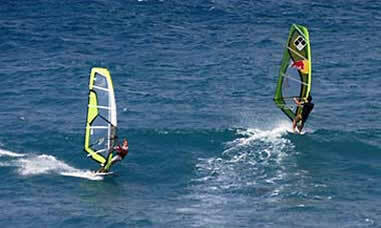 An offshore reef provides calm water for swimming and windsurfing, while the steady breezes at nearby Kailua Beach Park have given it the reputation of Oahu’s Windsurfing Capital. Just a few miles inland from these two family-friendly beach parks rises the dramatic Koolau Range. Popular with expert bodysurfers and bodyboarders, the quarter-mile-long crescent at Sandy Beach is pummeled by a brutal break giving it a reputation for the most lifeguard rescues on Oahu. 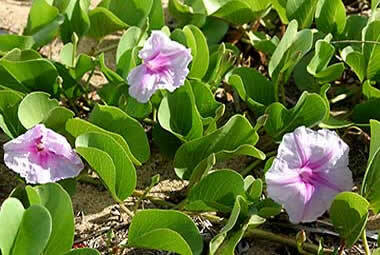 While the action is fun to watch, sprawling morning glories belie the vicious surf. Nothing beats an aerial view of a tropical island surrounded by sapphire water lapping at palm-fringed beaches, and Oahu offers several options via helicopters, ziplines, and glider rides out of Dillingham Field. If you prefer to keep your feet on the ground, the island is latticed with hiking trails leading to isolated waterfalls, ancient Hawaiian heiau (temples), secluded beaches and mind-blowing views. The Diamond Head Summit Trail is a reasonable 1.6-mile round-trip jaunt with a 560-foot elevation gain leading to a view along the leeward coast from Waikiki to Waianae. Tip: Stop at the Visitor Center and rent an audio tour explaining the natural and human history and legends of this extinct volcanic crater. On the outskirts of Honolulu, an easy trail through an urban rainforest leads to 150-foot Manoa Falls. The Maunawili Falls Trail crosses multiple streams beneath a forested cover before reaching its namesake 20-foot cascade. 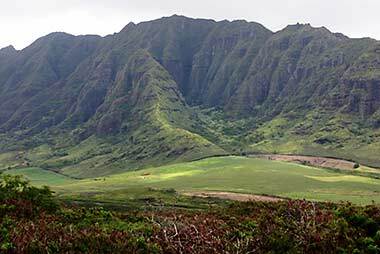 The 37-mile-long spine of the Koolau Mountains offers numerous routes of varying length and challenge, punctuated with wetlands, precipitous cliffs and cavernous valleys. The 4.8-mile Aiea Loop Trail wanders below a shaded canopy delivering views of Pearl Harbor and Honolulu, while Waahila Ridge Trail ascends to the top of the mountains providing views of Manoa Valley, Honolulu and the Windward coast. home to a shark goddess who controlled the ocean off the Point. Kaena Point & Natural Area Reserve is Oahu’s western-most point, a 59-acre sanctuary where Laysan albatross nest in the dunes, brown and red-footed boobies hop about the stunted foliage, and monk seals and green sea turtles bask on the sandy shore. 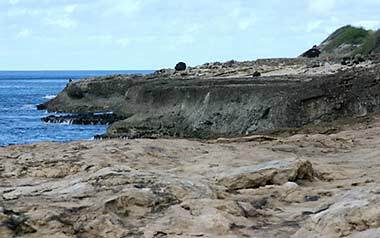 It is easily accessible from either side of the island (north of Waianae on the leeward side or west from Mokuleia on the north shore) via non-motorized access along an old dirt road overlooking tidal pools and small volcanic arches. 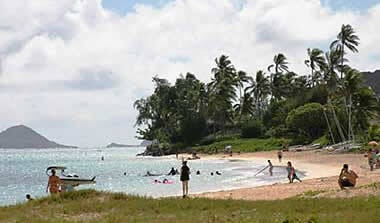 The Point is part of 853-acre Kaena Point State Park. Tropical blooms embellish Oahu’s many hiking trails, parks and gardens. Even the inner basin of Koko Head has the Koko Crater Botanical Garden dedicated to cacti and succulents from around the world. Following an abandoned railroad track, the route up Koko Head serves up an amazing view of Oahu’s south shore from its 1,208-foot summit. 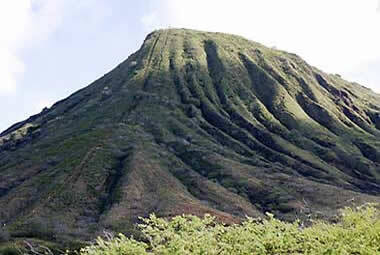 More than 1,000 steps ascend the steep 642-foot volcanic cone, giving it the nickname Nature’s Stairmaster. If your wish is to test your mettle on one of the island’s most challenging trails, the Olomana Trail is not for the faint of heart as it scales the three summits of Mount Olomana, the tallest reaching a 1,643-foot elevation. If huffing-and-hoofing it or aerial vistas aren’t your cup of tea for seeking out the views, a number of drivable scenic overlooks are worth checking out. Easily accessed from Honolulu/Waikiki and amazing day or night, the Mount Tantalus Lookout and Puu Ualakaa State Park provide panoramic views of Honolulu and the surrounding landscape from more than 2,000 feet above sea level. Nuuanu Pali State Wayside & Lookout, although the tragic location where 400 of King Kalanikupule’s warriors were driven to their deaths, is a great place to enjoy the sunrise and the night lights of Kanehoe and Kailua. In Part 2 we’ll explore Oahu through its legendary history and the surprises it offers today’s visitor. For more background on Hawaii, check out the first article in this series, “Hawaii: Ten Reasons WHY” (highonadventure.com/hoa16jul/vicki/why-hawaii.htm). 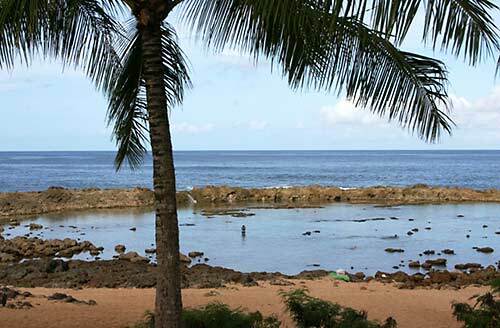 For a look at the island of Kauai, see “Mystical Kauai” (highonadventure.com/hoa17jul/vicki2/mystical-kauai.htm). Check the next issue of HighonAdventure for Part 2. Truffles outfitted for a snorkeling adventure in the waters off Papaoneone Beach. The Hawaiian Language (‘olelo Hawai’i) Written Hawaiian includes some unusual characters called diacritical markings which change the meaning of words and how they are spelled and pronounced. One of these is an upside-down apostrophe, called an okina or glottal stop, which forces a small pause between sounds when speaking. While many Hawaiian words, including Hawai’i and O’ahu, are properly spelled using these diacritical markings, this article does not include them because they are not properly deciphered by all computer and fonts. Many Hawaiian words with two vowels in a row have an okina between them, which for those not used to Hawaiian can appear confusing when reading it (Hawai’i, O’ahu, Nu’uanu, Ko’olau, Ka’ena, Makapu’u, Wai’anae, etc).